During two ceremonies nearly 100 years ago today—one at 2:30 in the afternoon and the other at 8:30 in the evening on January 26, 1899—the cornerstone of the Newark Public Library was put into place by Mayor James M. Seymour. The ceremony took place before an excited crowd of onlookers. 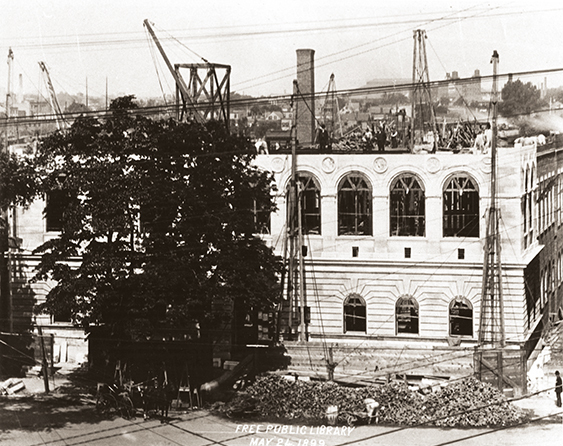 Not only were they experiencing the beginning phases of construction of the city’s most beautiful and elegant building, they were witnessing the realization that a truly unique American institution, the public library, was being born before their eyes. In Newark, the concept of the public library was completely different than its counterparts in Europe or elsewhere. In great university communities here and abroad, libraries were intended for the wealthy, privileged and elite. Throughout the nation great libraries generally had been given to various communities by the powerful and rich or by the great philanthropists such as Andrew Carnegie. In Newark, our library was voted upon by the electorate. Money for its construction was made possible by the raising of taxes. In other words, Newark created the concept of its library home and paid for it. Many firsts in library service which became the accepted norm in later years took hold here. They include the use of the telephone in reference service, the opening of the library stacks, the creation of the nation’s first business library, the creation of an art and music collection, the assembly of local historical materials and the expansion of branches. Some of these ideas Newark created. Others were adopted in the beginning of the century as part of the institution’s operations. As a result of the library’s steadfastness, we now celebrate 100 years of service in the beautiful Italian-style building at the head of Washington Park on the street of the same name. On Sunday, January 29, 1899, the dignified old Sunday Call reported the day’s festivities in the following way. 'The work of rearing the new Free Public Library was given the form word 'godspeed' on Thursday, when the cornerstone was laid with suitable ceremonies. The exercises at the new building were simple, but impressive. It was thought best to have the exercises in the open air as possible owing to the uncertainty of the weather. As it happened, the day was mild and pleasant, and the sun shone on the new enterprise.' Two separate events were planned on January 26, one at the new site in the afternoon, the other an evening ceremony in the old library building on West Park Street. The afternoon program at 2:30 involved various members of trustee committees responsible for construction as well as the mayor, superintendent of the board of education, and local clergy who opened and closed the program. The evening program at 8:30 involved the mayor once again, the president of the library board of trustees, and three addresses on library books and library users by the Right Rev. Monsignor Doane, William T. Hunt, and the Hon. Cortland Parker. Those events marked more than just the beginning of a beautiful, city-endorsed architectural and intellectual landmark. They also signaled the start of an era when libraries were to include the word public in their very name—the beginning of a people’s library for the American people. The afternoon meeting was opened by James E. Howell, prominent Newark businessman who filled in for Edward H. Durjee, ill that day. Commented Howell, 'I congratulate you as citizens of Newark, not only on the library that you own and have free access to, but more upon what you will have when the new building shall have been completed.' Most Americans of that time needed to belong to a library association and pay dues or rental for privileges considered common today. The Rev. Dr. Louis Shreve Osborne of Trinity Church offered his salutation: 'May the foundation of this institution rest upon thy favor. Anoint our brains and intellects, as truly as our hearts and souls, with unction from on high…' Trustee and finance committee chairman Richard C. Jenkinson read a list of articles which were being deposited in a box to be placed in the cornerstone. Included were photographs taken on January 21, 1899, lists of library employees, plans for the building, miscellaneous publications and local newspapers of the day. Jenkinson was an important Newark civic leader and manufacturer. In later years, he left the library its important Jenkinson collection—300 items in 1925 and an additional 800 rare books in 1929. The local press commented, 'together they (the two installments of rare books) constitute one of the finest collections in the country. Their catalogs themselves are works of art.' Setting an example Jenkinson said he gave the items to his native city, 'because I love it and its people, and with a hope that this may grow to be a collection of large proportions and high value; a thing that leads others to follow my example and that will help raise the standards of printing in my city.' Next, he presented a symbolic trowel to the mayor, as the library’s board president, noting, 'It is fit, then, that this tool made by mechanics of this city should be used for the laying of the cornerstone of this building which is being erected at the expense of this great manufacturing city for storing the lore of the age to which all of its inhabitants, whether rich or poor, or whatever creed or nationality are to have free access, restricted only by the rules necessary for the preservation of the valuable volumes collected here.' Mayor Seymour then laid the cornerstone—crediting his predecessor, Mayor Joseph Haynes, whose life was dedicated to education in Newark—by noting: 'We owe to him and others a debt of gratitude for the enterprise displayed in advancing the plan of creating this institution, providing for it a dignified home, and securing a mandatory and sufficient income for its maintenance. With feelings of profound satisfaction, which I know are shared by all 260,000 citizens, I do hereby as president of the board of trustees, lay in place the cornerstone of this institution on which its walls will be reared. The workmen have faithfully and skillfully performed their duties, and I declare the corner stone to be correctly laid.' The ceremony concluded with a benediction by the Rev. Daniel Halleron, pastor of the Halsey Street Methodist Church. At 8:30 in the old library building on West Park Street, Rev. Monsignor George Herbert Doane, director of St. Patrick’s Cathedral, delivered a discourse on 'Books and Reading' in which he expressed his admiration for having a great library in town and not having to travel to New York to visit the New York library or book dealers and shops to learn from the printed page. With the opening of a great library on Washington Park, Newark 'will have a center of intellectual light and heart for many generations, a thing of beauty and joy forever…,' he said. William T. Hunt, editor of the Newark Sunday Call, talked about 'The Public and the Library.' He commended Newark for building its own library and taxing itself in the process. Newarkers did not wait for Carnegie to hand them a library; they built their own, he pointed out. Hunt aded, 'I tell you, the faith I have in Newark is the faith I have in the destiny of the American people, for the same reasons, and the assurance of my faith is that Newark can evolve from its simple life and unambitious career, such works as this public library and the parks and the school and the churches, all which are part of Newark democracy and owe not to class or to patron.' Parker, a distinguished jurist, gave a speech simply entitled 'The Public Library' in which he recounted the past quarter-century of library usage in Newark and stressed the importance of looking to the future. He noted the fact that a public building opened only 10 years ago had already become too small for public demand and that even this magnificent present structure would also someday face the same difficulty as the city and its needs again change over and over again. He concluded, 'We open this hall to the inhabitants of the city of Newark. We open it for the study of literature, we open it to our artisans and our professional men, we open it to all as a place of rational entertainment, we open it in the hope and confident belief for the varied uses for which it was designed, and we welcome you, therefore, to a place which we hope will ever be to you attractive, as well from healthful influence it will exercise, as new sources of enjoyment and instruction it offer.' Amidst the old library building decorated with the potted urns, the American flags, and the red, white, and blue bunting, the hopes for a people’s university had truly sprung forth, and began to blossom. With the arrival of America’s best-known librarian, John Cotton Dana—the George Washington of the library world for more than a quarter-century—Newark was assured a formidable niche in the nation’s cultural pantheon. The result of all these dedicated efforts was the completion of the first great public building constructed by the city of Newark, shaped architecturally like a near-perfect Italian Renaissance palace at the north end of Washington Park. For a century it has stood as an informational milestone in the history of our city and state. Designed through a national architectural competition by the Philadelphia architectural firm of Rankin and Kellogg, the building is smaller but very similar to the great Boston Public Library. The original design was heavily influenced by the Palazzo Strozzi in Florence, Italy, designed by Benedetto Da Maiano in 1489 and completed in 1536. Completed in 1901, the building was added to in 1922 and 1931. A maintenance building went up in the 1950s. A major alteration was completed between 1950 and 1952. The main building, of Italian Renaissance design, faces Washington Street and is four stories high. The first floor includes rounded windows and horizontal grooving characteristic of the Italian Renaissance style. The main entrance is flanked by great Roman iron and glass lanterns. A decorative ornamental frieze separates the first and second stories. The second floor includes nine great rounded windows separated by fine pilasters. In the spandrels are medallions. Those at the end and two in the center have bas-relief symbolizing knowledge with a book and a lamp. The third floor has a course of windows in flat arches with molding outlining each window, and slender pilasters of Corinthian columns separate each. The frieze below the third-floor cornice and above the windows 'proclaims the various provinces of human knowledge as stated in l901: philosophy, religion, sociology, philology, science, fine arts, literature and history.' Above the front door is a bronze relief by John Flanagan which represents Wisdom teaching the Sons of Man. The artist was a native Newarker who lived on Newark Street. Some of his better-known works include the statue of Joseph Henry in Albany, a clock at the Library of Congress, and the design of the George Washington quarters. The library’s vestibule is white Italian marble and the lobby wainscoting of decorative marble includes Roseal and Carrara marble from the finest quarries in Italy and Tennessee. When entering the building, the viewer is faced with a great three-story atrium or cortelle encased with some of the world’s finest marble topped by a delicate skylight and roof. The marble balustrades on each floor complement one another and their back walls are painted in appropriate Renaissance-period colors. The great public room across the entire front of the second floor, Centennial Hall, is named in honor of the library’s founding. Across the ceiling are the marks of the great printers of the world. Many of the printers’ works can be found in the library’s rare-book collection. Forgotten but not lost are names such as Thomas Anshelm, Erhard Oglin, Aldus Manutius, Robert Copeland and Christopher Plantin. At the far ends of the great hall over the marine wood burning fireplaces, the names of William Caxton and William Morris are unmistakable. A third great decorative feature of the early library years is the mural on the outside of Centennial Hall, 'The Fountain of Knowledge' by Ives Gammell. It is a three-panel monumental piece installed in 1929 and refurbished in 1989. The work is a large triptych dominated by Apollo surrounded by the nine muses. According to classical Greek mythology, the muses are the daughters of Zeus and Mnemosyne and include Calliope for epic poetry and eloquence; Euterpe, music or lyric poetry; Erato, poetry of love; Polyhymnia, oratory or sacred poetry; Clio, history; Melpomene, tragedy; Thalia, comedy; Terpsichore, choral song and dance, and Urania, astronomy. According to legend, Apollo is the muses’ leader. They are portrayed in the mural as taking knowledge to the four corners of the world. A Greek-robed John Cotton Dana, Newark’s famed librarian, observes the scene from the mural’s far-left corner. Classical cornices, marble halls, herringbone-patterned floors and an elegant Renaissance flavor abound throughout this singularly most important Renaissance building in Newark. For a century, the library has been the uncompromising center for the storage of information, learning and recreational reading for all Newarkers. As its first century concludes, and another millennium begins, there is need for an expanded facility for today’s Newarkers and those who will reside in the city in the 21st century.